The bronze statue that graces the entrance courtyard of the Law Center honors Albertus Magnus, or Albert the Great, a medieval theologian and "Man of Universal Knowledge." Born in Lauingen, Bavaria sometime between 1193 and 1206, he was a bishop, doctor and saint of the Roman Catholic Church, having as one of his students Saint Thomas Aquinas. He taught in Paris and at the Studium Generale in Cologne, a university run by the Order of the Dominicans in the 13th century and one of the first universities in Europe. A dominant figure, he was an influential teacher, an experienced traveler, a keen observer of life and nature and the one learned man of the Golden Age to be called "the Great." He was later declared a saint by the Catholic Church. Albertus Magnus is the best-known work of German sculptor Gerhard Marcks (1889 - 1981) and considered to be his finest by many scholars and artists. 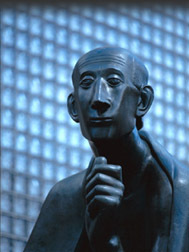 The Law Center’s signature sculpture was made from a special cast in Dusseldorf by permission of Marcks and his family. Two other castings exist: one at Albertus Magnus University of Cologne, Germany, and another at the La Universidad de los Andes. 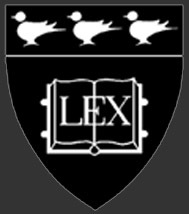 The Law Center seal includes three martlets above an opened text inscribed with “LEX,” the Latin word for law. Martlets, symbolizing peace and deliverance, also appear in the University of Houston seal – which in turn is drawn from the coat of arms of General Sam Houston who claimed descent from Sir Hugh of Padavan, an 11th century Norman knight. As of 2015, The Lex seal is no longer in use under current branding guidelines. However, it has a rich history at UHLC.